The Christmas markets in Germany are famous for their craft stalls, gluwein and generally Christmassy atmosphere. I’ve gone to several in past years; the one in Oldenburg is only about an hour away from my home here in Groningen. Though they’re much less well-known, Dutch cities, including Groningen, also run Christmas markets. 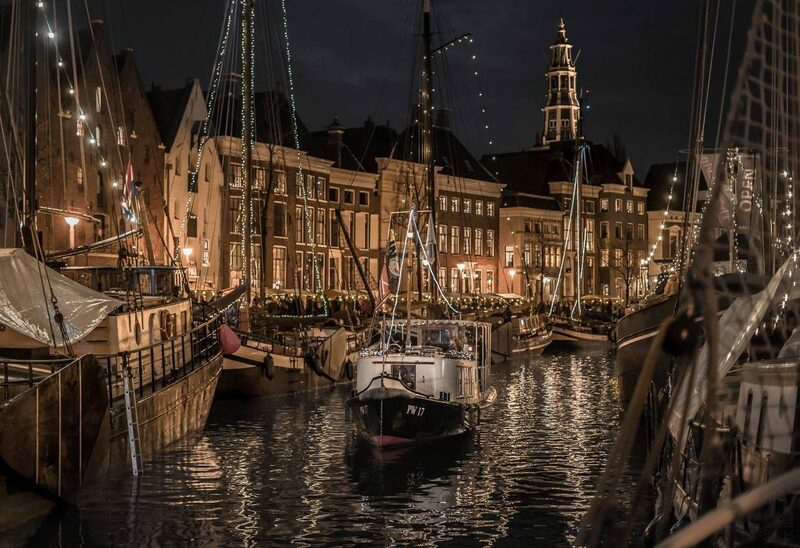 Groningen’s is called WinterWelVaart, and it adds a unique twist on the usual Christmas market. Instead of holding the market on the central plaza as you’d expect, WinterWelVaart takes place along the most picturesque canals in Groningen: the Lage der A, the Hoge der A and the Kleine der A. This is a beautiful part of town: historic buildings front the canals, undamaged in the wartime bombing that left its mark on other parts of the city center. Many are former warehouses, identifiable by the vertical line of large doors and the mechanism on the gable that used to be used to lift cargo into and out of the building. (Actually, in many buildings they’re still used, but now that the buildings have been converted into apartments, they’re used to lift furniture in and out instead of struggling with the typically narrow, steep stairways.) Some are rather grand former homes of the wealthier merchants, many of which are now used for offices or divided into apartments. 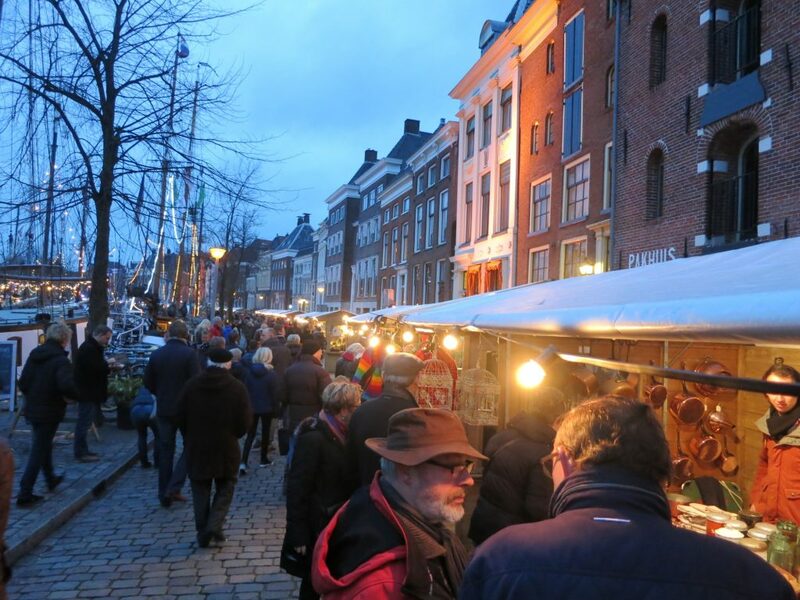 For WinterWelVaart, the usual Christmas market stalls line the canals on both sides, though the proportion of crafts to food and drink stalls is different than in Germany. The German markets have far more food and drink on offer, perhaps as many as 40 or 50 percent of the stalls, I’d guess. Here I don’t think it’s more than about 20 percent. The twist, though—what makes this market different and special—is that the canal itself is lined with moored historical ships. Most of these were built originally to sail the canals as cargo ships, but have been converted to other uses since then. Winterwelvaart at night. Photo courtesy of Rianne Mellema. Check out her Instagram feed @rieannuh. For WinterWelVaart visitors, the ships are available to board and explore. Many, for the duration of the fair—only three days—become venues for all sorts of activities: musical performances, art exhibits, and story telling, to name the most common. Never mind exploring all the craft stalls; it would be easy to spend hours hopping from one ship to the next, enjoying the coziness and the entertainment. 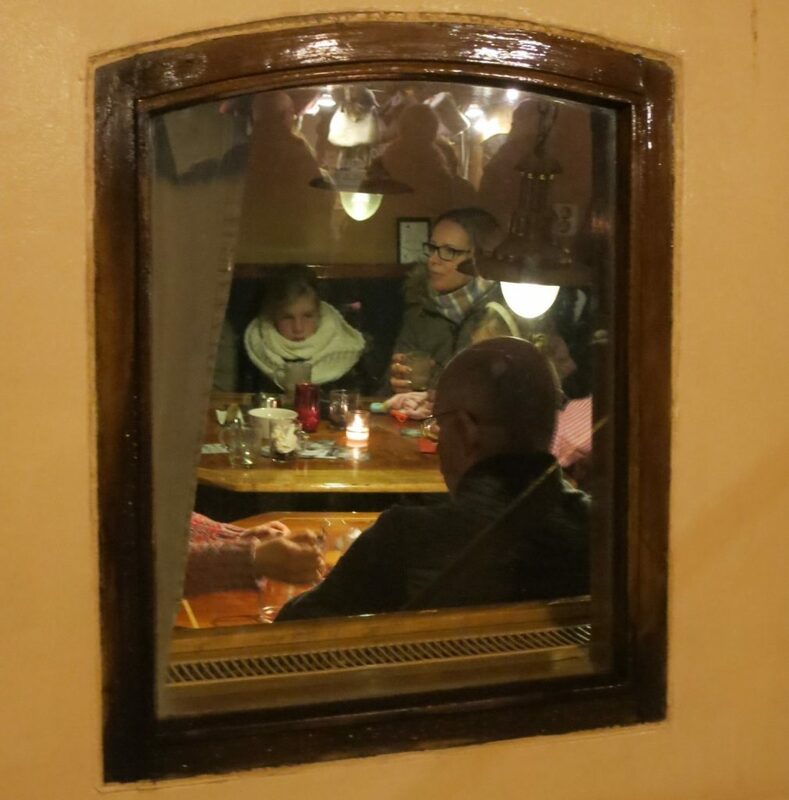 Doesn’t this ship, serving as a cafe, look cozy inside? You might be wondering, if you have ever spotted Groningen on a map of the Netherlands, why a maritime theme was chosen for the Christmas market here. It’s not on a coast, after all. It was, however, one of the Hanseatic League cities and later a very important center of trade in peat, the dominant fuel in the 16th and 17th century. Transporting cargo all over the Netherlands was done primarily by canal until the mid-20th century, and it’s still common to see long, low cargo ships passing on Holland’s canals serving domestic shipping needs. The truth is, though, that most of the ships at WinterWelVaart are not as old as the peat trade: most stem from the early 20th century. The event is organized in part by the local maritime museum as an easy introduction to Groningen’s maritime history. WinterWelVaart is a great word for this event. Welvaart means “prosperity,” so it can be translated as “Winter Prosperity.” To take the name apart further, the word vaart can mean “canal,” and it can mean “speed.” So another translation could be something like “winter good speed,” meaning “traveling well” or “good journey”. That fits nicely with the nautical theme: it’s about a good journey through winter, starting with this market for Christmas. WinterWelVaart happens every year just before Christmas. Their website is in Dutch, but the dates should be right near the top of the page. WinterWelVaart looks like a wonderful place to visit. I think one could easily wander there for hours, not only to look at the markets, but the boats and the buildings. I really think I should go to Europe next Christmas! The whole winter Christmas is so appealing here in summer Australia. Enjoy the rest of your week. 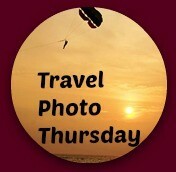 I was happy to meet you here today at Travel Photo Thursday. A Christmas market trip would be so much fun! Take public transportation so you can drink gluwein! Check out this pinterest board: https://www.pinterest.com/santafetraveler/christmas-markets-in-europe/ It’s all about Christmas markets! This is the most interesting Christmas Market I’ve heard of. The fact that it was along the canal was enough for me, but being able to view the ships and their exhibits. I would go each of the three days just to board a different ship and experience them all. Fantastic Rachel. Go for it! I’ll be there tonight! Last year I didn’t stay for many of the shows in the boats, partly because the most popular ones were so crowded that I got a bit claustrophobic. But between shows you can also just explore the ship itself, which is interesting too! Rachel, what a great surprise! Like you mentioned, this market is very unique (have not heard of something similar before). I like that you can get on the boats. Who owns the ships? What kind of “entertainment” is available inside the ships? The boats are mostly privately-owned and used for things like charter sailing, events or bed and breakfasts. The entertainment is mostly music, from rock bands to sea chantey choruses! Hi Rachel. What a great idea for a Christmas market! Being from Halifax, on the North Atlantic, is definitely one of the reasons it’s so appealing. The navy ships are always lit up in our harbour, and so pretty. I’d be with Jan for the full 3 nights, hopping from ship to ship! Maybe that’s why it appealed to me so much: I grew up on the coast (of Connecticut) too!